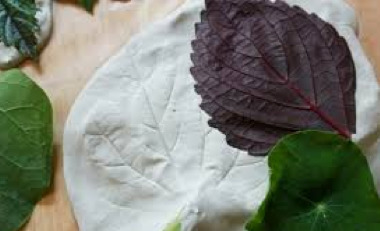 Did you make handprint casts in elementary school, or perhaps leaf casts? Maybe you have a handprint from a grandchild. Photo from Body Casting Sydney. Back in my day, ashtrays were the most popular form. Press your hand in the middle of the modeling clay circle, lift the edges upward to form a bowl, let it dry, and voilà a memory. Maybe yours was for a coaster or Christmas tree ornament. Molding body parts made me wonder what was happening today in the world of nostalgic body casting. Yes, I'd love to do the hands/arms with my husband, daughter, and son-in-law. When I saw this one from http://www.incredibleart.org/lessons/middle/Lotte-bodyart.htm (scroll to middle of web page) I envisioned Amanda resting after a day of teaching. Couldn't stop there — had to know more about the whys and wherefores of this artist expression. The first thing that came to mind was death masks of centuries past, such as those in the Egyptian mummification process. The early Romans used wax and plaster, and later stone. 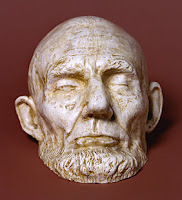 It was common in 10th century European countries to create death masks of famous people for display at funerals. Often the masks served as a model for after-death portraits. In the 18th & 19th centuries, they were used to permanently record facial features of unknown corpses. Hands were cast in case the face wasn't recognizable. Phrenologists used life and death masks in their studies. 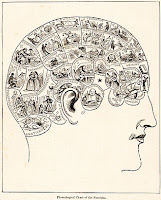 The study of Phrenology, which focuses on personality and character, is a pseudomedicine and pseudoscientific method focused on human skull measurements. Phrenology was developed by Franz Joseph Gall in 1796 and gained popularity between 1810 and 1840. The Edinburgh Phrenological Society was formed in 1820 and became the principal British center for this study. Gall, a German physician, believed that character, thoughts, and emotions, three of the 27 determiners of personality, are found in specific areas of the brain, and that the skull accommodated and formed different sizes around these areas. This supposedly offered an understanding of the person's capacity for a specific personality trait. It didn't explain why a notably generous person, known and observed by friends and family, had a small area of skull covering that trait. Rather than interred with the deceased, as was done prior to the Middle Ages, they were used in the funeral services and ceremonies then given to family or bequeathed to museums, libraries, and universities. Collecting life and death masks of famous people became a prestigious undertaking. I started to type "hobby," but that sounds frivolous and these folks were serious collectors. In Harper's New Monthly Magazine, Vol. LXXXV, July to October 1892, Laurence Hutton wrote three lengthy articles on his collection of death-masks. He collected notables like Dante, William Shakespeare, Mendelssohn, Sir Isaac Newton, and many others. Although I started this research with death masks, I was glad to find life masks. Below is Beethoven's life mask made in 1812 by Franz Klein and now resides at Princeton University. Noel Morris in his article Beethoven's smile—yes, he had one (http://blogs.wfmt.com/offmic/2013/12/16/beethovens-smile/) shares, "In this process, the artist covers the subject's face in oil, and inserts straws in the nostrils. Then the artist coats the subject's face in plaster and lets it dry. The story goes that Beethoven panicked and ripped the cast off of his face; though he later calmed down and permitted the second application." 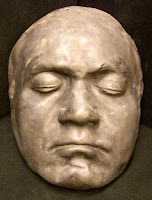 Beethoven scholar, David Dennis says, "The life mask captured many things, including pock marks that must have resulted from an early illness, and the stern, growling face that has been the basis for almost every portrait ever done of him-posthumously." On February 11, 1965, two months before Lincoln's death, sculptor Clark Mills (1815-1883) made a second life mask. Mills followed the same basic procedure that Volk had used. 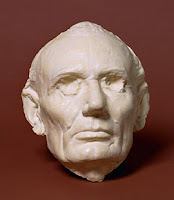 It was evident from the life masks that the Civil War had taken a toll on Lincoln's heath. He confided to friends, "I am very unwell." I had the opportunity at the University of Texas-Arlington to interpret for a talented artist who was deaf. One of her classes was sculpting. Life masks was the first project. After seeing the process, which hadn't changed any since before 1812, I declined the invitation. Now, I kinda — almost nearly — but not quite, wish I had taken the plunge. I think it was the straws up the nostrils that sealed the deal. 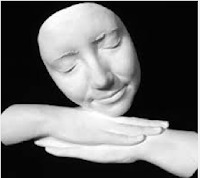 Have you had any life mask, hand casts, or body casting experiences? Would you go under the straws? Lin and her husband, Jerry, live on a ranch in Chimney Rock, Colorado. 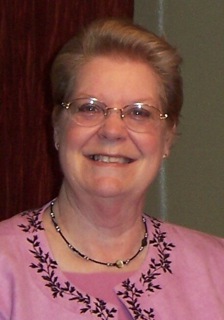 She writes historical fiction for adults and children. Her novella The Lye Water Bride is included in the California Gold Rush Romance Collection (Barbour Publishing, August 2016). Great post. I actually had a chance to see Abraham Lincoln's cast at the National Gallery, part of the Smithsonian in DC. It sure was something. Thank you. Thank you and thanks for stopping by. I wish I'd been there with you. That must have been a marvelous experience. It's really amazing how much Lincoln changed in just five years. I thought at first the masks were probably a 20-year difference. I don't think I could stand having a mask made of my face, especially if you have to breathe through straws. No thank you! Interesting topic! Hi Vickie, yes, it was amazing what five years did to him. I was surprised that masks were so common, and displayed in the homes, because photos were not the norm, portrait artists were rare. Fascinating post. I've seen the Lincoln masks in D.C. I'm with Vickie, I couldn't stand to have that stuff on my face and have to breathe through straws in my nose. 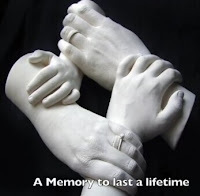 I dis have a handcast of our oldest son, but I don't know what happened to it. He made it in kindergarten. He's now 54 years old. Hi Martha, after finishing this post, I dug around in the basement and found Amanda's fourth grade casts. She'll be 47 this year. It's amazing how something so simple can bring back such sweet memories.